Sitting at the edge of the National Forest and just below the beautiful Buffalo Mountain, these two-bedroom condos at Snowscape offer the best of Colorado. Magnificent views, ideal location, clubhouse amenities, wood-burning fireplaces and a welcoming place to call home are yours during your vacation in the Rocky Mountains. 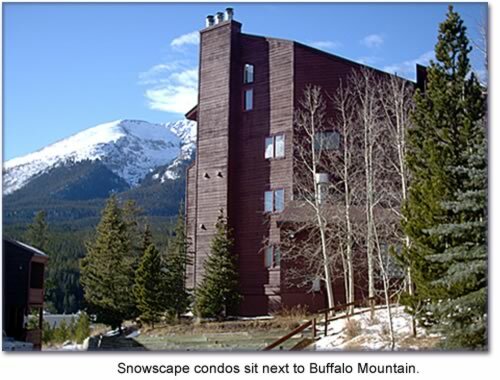 Snowscape condos are located in the Wildernest area of Silverthorne. Where else can you be less than 30 minutes to 7 world class ski resorts (Arapahoe Basin, Loveland, Keystone, Breckenridge, Copper, Vail and Beaver Creek), but still be nestled into a mountain paradise? All units have WiFi internet access, cable television, wood-burning fireplaces, fully-stocked kitchens and capacity to sleep 6.